Should McDonald's Really Be Spending So Much Money on Buybacks Right Now? If McDonald's follows through on its plans to return capital to shareholders, it will buy back a record amount of stock at highly inflated valuation. A McDonald's location in Bejing, China. Image source: McDonald's. One element of McDonald's (NYSE:MCD) ongoing turnaround plan, which it implemented last year to stem the outflow of customers, is to increase the amount of capital that it returns to shareholders. While this undoubtedly sounds great to existing investors, there's reason to believe that this piece of McDonald's strategy may do more harm than good. McDonald's problem right now is that its customers are defecting. Last year marked the third year in a row that its guest count dropped on a year-over-year basis, falling by 2.3%. The burger giant has responded by announcing a turnaround plan to be led by its new CEO, Steve Easterbrook. The priorities of its plan are threefold: drive operational growth, create brand excitement, and enhance financial value. The first two concern simplifying the menu, improving its operations, and implementing a new marketing strategy. These make sense, but it's the third element of McDonald's turnaround plan that could destroy more value than it creates. A core piece of McDonald's strategy to enhance financial value is to replace equity on its balance sheet with debt. This will increase leverage and thereby boost its return on equity. To this end, the company committed itself to returning $30 billion to shareholders over a three-year period, with 2016 being the final year. The Company returned $9.4 billion to shareholders through dividends and share repurchases for the year. This brings the cumulative return to shareholders to $15.8 billion for the two-year period ending 2015 versus the targeted return of about $30 billion for the three-year period ending 2016. You can see the impact of this on the trend in McDonald's yearly stock buybacks. From 2010 to 2014, it spent an average of $2.7 billion each year on repurchasing stock. But that number more than doubled last year to $6.2 billion. Data source: McDonald's 2015 10-K, page 12. And herein lies the problem. For McDonald's to meet its goal of returning $30 billion over the three-year stretch from 2014-16, it has to return $14.2 billion this year. At its current run rate, dividends will account for approximately $3.2 billion of this. That leaves $11 billion to be spent on share buybacks. Generally speaking, returning capital to shareholders via buybacks is a prudent approach. 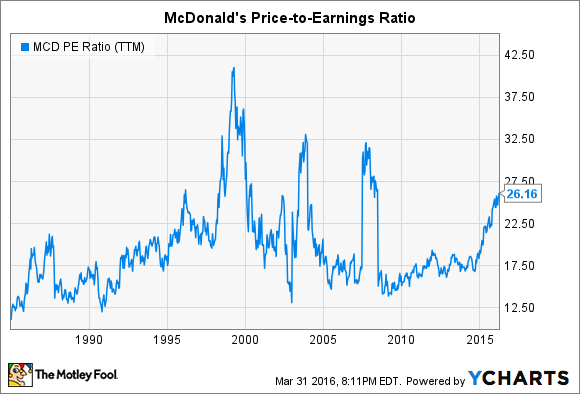 In McDonald's case, however, its stock is currently trading for a meaningful premium based on its historical trend. You can see this in the chart below, which shows that shares of the burger giant are valued at 26 times its earnings over the past 12 months. That's roughly 50% higher than its valuation over the five years preceding 2015. MCD P/E Ratio (TTM) data by YCharts. From a valuation perspective, in other words, there couldn't be a worse time for McDonald's to be contemplating repurchasing so much stock. While it's understandable that its new CEO wants to give shareholders something to hang their proverbial hats on at the outset of his tenure, you'd be excused for wondering whether destroying value by boosting buybacks by billions of dollars right now is the most effective way to do so.